Northwoods Lodge is a unique log lodge in a peaceful setting in the beautiful resort area of Indian River, Michigan. 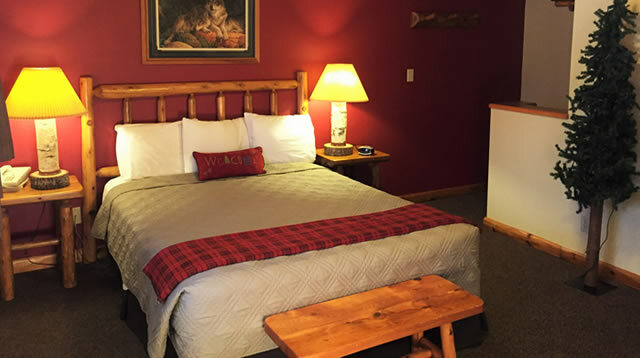 With only 15 rooms, this award-winning lodge offers you the quaintness of a Bed & Breakfast with the privacy of a motel. 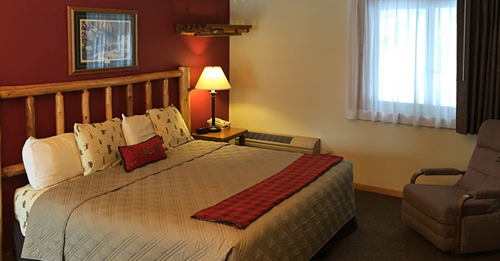 All recently renovated rooms are "Northwoods" themed and include log furniture, wildlife art, and even a pine tree. Let us share with you our rustic, cozy warmth! 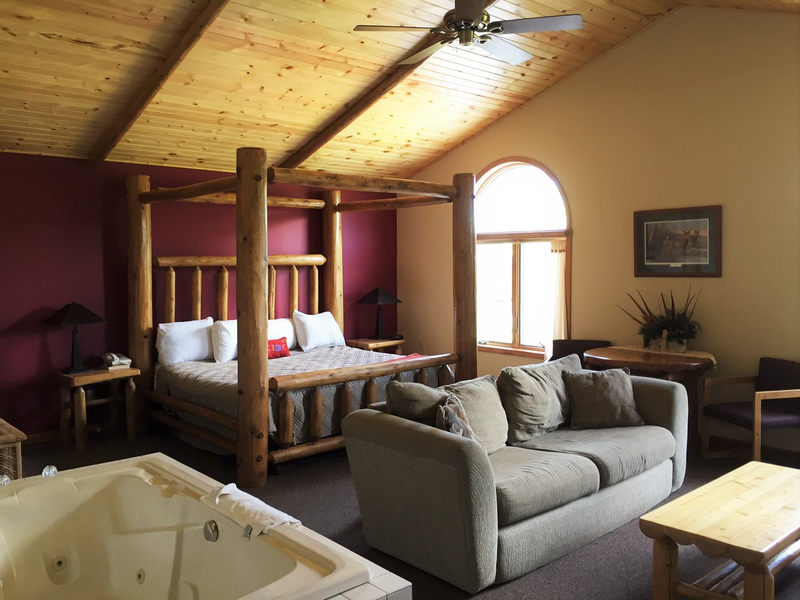 In 2015 all rooms were completely renovated with new paint, carpet, bedding, drapes, furniture, tongue and groove wood ceilings, curved shower rods and new tile floors in the bathrooms! Room amenities include microwave, coffee maker and mini-refrigerator, flat screen TV’s with HBO, free high-speed wireless, air conditioning, hair dryer and free local calls. Rollaways available upon request. An enhanced Continental Breakfast** is included featuring hot Belgian Waffles, coffee, orange juice, cereal, bagels, breads, doughnuts, and more! 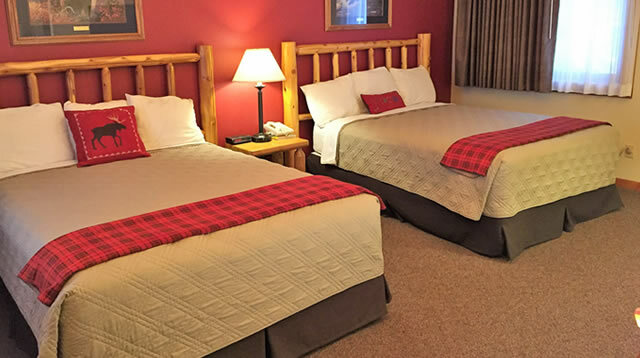 We also offer a gorgeous honeymoon suite with in-room Jacuzzi and king log canopy bed, a kid-friendly room with log bunk beds, a handicap accessible room, and 2 pet-friendly rooms. Daily housekeeping is included. All our rooms are non-smoking. Feel free to contact our 24-hour front desk for local information during your stay. We have a centrally-located lobby with fireplace, 2 leather couches, magazines, TV, "Up North" Gift Shop, ice, pop and snacks, with tables and chairs that are perfect for playing cards or checkers! Our lodge is surrounded by a very large grassy yard, bonfire area with picnic tables, BBQ grill and a small pond and nature / hiking trail. There is ample room for trailer parking and boat docking is available just 1/2 mile away on the Indian River. The North-Central State Trail is directly across the street for snowmobiling, bicycling and walking. We only use ENVIRONMENTALLY FRIENDLY laundry soap and cleaners, ho harsh chemicals! Discounts at Big Bear Adventures which offers exciting Canoe, Kayak, Raft & Tube Trips on the crystal-clear Sturgeon River, and a family fun center featuring 18-Hole Adventure Golf, Bumper Boats and a Ropes Challenge Course. Winter offers X-C ski and snowshoe rentals and guided raft trips. Located directly across from the North Central State Trail. Big Bear Adventures offers shuttle service and you can more info HERE. VIP CARD which includes 10% discount at Big Bear Adventures and SUBWAY of Indian River. Substantial discounts at Indian River Golf Club. 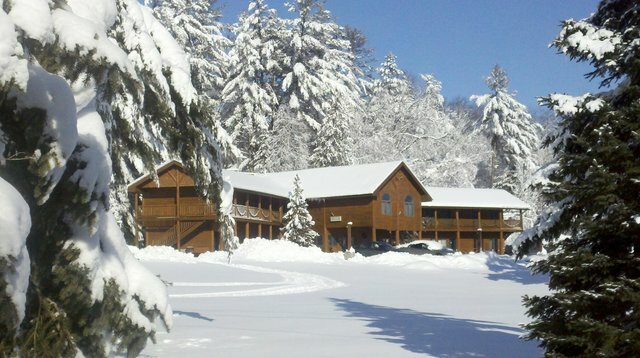 Please call us at 231-238-7729 for the rates of the season. We are the HEART of Michigan’s beautiful North Country conveniently located in the center of Northern Lower Michigan. We’re nestled between Burt Lake and Mullett Lake, the 3rd and 4th largest lakes in the state! We’re also within 30 miles of all major attractions: Mackinac Island, Mackinaw City, Petoskey, Harbor Springs, Gaylord, local casinos, and ski resorts. We invite you to experience the opportunities for unlimited outdoor recreation and family fun! Come join us to have a true Northern Michigan adventure! ** Continental Breakfast offered year round with the exception of Monday- Friday from October 23rd, 2017 - April 20th, 2018 during the off-season.